An intelligent and scholarly guidebook that is actually fun to read. The writers have a sense of humour, a love of history and a liking for good food and drink. Accurate guidebooks that are also entertaining are rare, but this is one of them. Excellently written, bursting with character. Filling the lifeless shell of the papal palace in Avignon with the lost trappings of the medieval popes is not an easy task for the imagination. And the more you learn, the hard it gets, for besides all the harlots, speculators, gluttons and cheats that Petrarch railed against, there seems to have been a shocking amount of voodoo. Accusations of sorcery had already sullied the name of one Occitan pope, Sylvester II (Gerbert of the Auvergne), who reigned from 999-1003 after studying in the Islamic schools in Toledo, where acquired a prophetic bronze head that advised him in sticky moments. Even today, his tombstone in St John Lateran is said to sweat and rattle before the death of each pope. In 1309, the French pope Clement V moved the Papacy from Rome to Avignon, then died from eating a plate of ground emeralds (prescribed by his doctor for a stomach ache). He was succeeded by John XXII, a native of Cahors, who owed his election to a magic knife that enchanted the conclave of cardinals. This John was also a famous alchemist, and he filled the papal treasury with gold, while King Philip V gave him a pair of languiers, or amulets shaped like serpents’ tongues, encrusted with gems that changed colour on contact with poison. They served the pope in good stead, as plenty of rivals in the Church were trying to do him in. The most notable culprits were Clement V’s doctor, caught manufacturing a diabolical homunculus, and Hugues Géraud, Bishop of Chaors, who confessed in 1317 that he had tried to assassinate the pope ‘by poison and by sorcery with wax images, ashes of spiders and toads, the gall of a pig, and the like substances’. John XXII ordered him burnt at the stake. The next pope, Benedict XII, spent hundreds of thousands of florins on a new palace, and still had enough gold and precious stones left over to top up his treasury– thanks, it is said, to an elderly woman residing in Avignon’s ghetto, who told him where to find the ‘treasure of the Jews’ buried under her hovel. And in the bitter end, just before the antipope Benedict XIII was forced to flee Avignon, he sealed up a secret room in the palace with a cache of solid gold statues confiding the secret to his friend, the Venetian ambassador. They were never found, although in Mistral’s epic, Poème du Rhône, three Venetian ladies who inherited the secret come back to the palace and remove the flagstones that cover up the secret room– only to discover a bottomless abyss. Thanks to the remarkable talents of Dana Facaros, Michael Pauls and John Ferro Sims, my husband and I (both now in our mid seventies but disgustingly fit) have, after years of long haul adventures, finally fallen madly in love with the South of France. We have just returned from our third trip and are still avid for more... I have never enjoyed a travel guide so much! 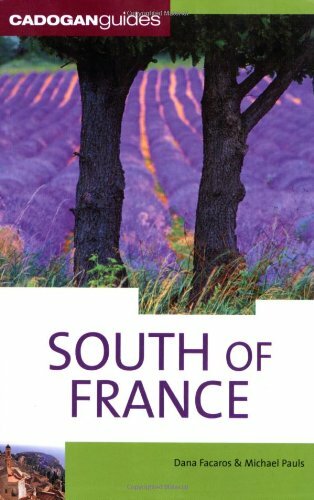 First of all I must say how much I enjoyed your guide to the South of France, It was one of the most informative and helpful guides I have yet used.